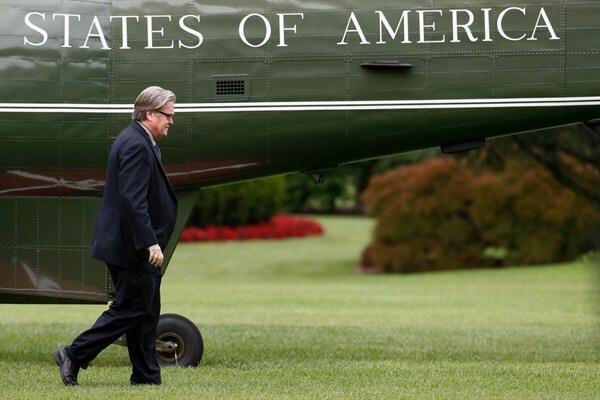 Stephen Bannon, the then-chief White House strategist to President Donald Trump, walks from Marine One on the South Lawn of the White House in Washington, May 13, 2017 (AP photo by Carolyn Kaster). The ouster of Stephen Bannon as White House senior strategist has removed the most visible link between President Donald Trump and his populist base. But the nationalist worldview that candidate Trump ran on and Bannon promoted is alive and well. And the core of that agenda is the defense and promotion of U.S. national sovereignty, which Trump’s followers believe is under assault from relentless globalization, encroaching international organizations and uncontrolled immigration.